following device Android, IOS, Symbian or Java phones. With UBA airtime recharge code you can buy airtime form your UBA bank account without stressing your self. 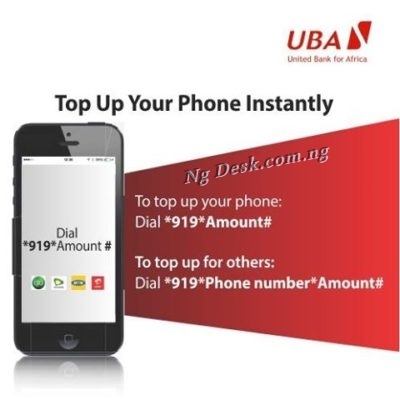 Dial *919*Amount# – example recharge of N1000, dial *901*1000# and send. To recharge other phone number for friends & family dial *901*Phone Number*Amount# – example Recharge of N5000, dial *919*08145087537*5000# and send.